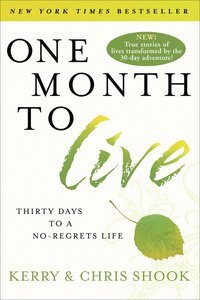 About "One Month to Live: Thirty Days to a No-Regrets Life"
Kerry Shook and his wife, Chris, founded Fellowship of The Woodlands in The Woodlands, Texas, with eight people in 1993. Now the church has grown to 14,000 in attendance each Sunday. Winner of the prestigious Church Health Award presented by Saddleback Church, Kerry and his church have been featured in numerous publications and media outlets. Kerrys sermons are televised each week across the country and around the world. Kerry and Chris are the parents of four children. Your time on earth is limited. No matter how much this idea makes you squirm, it’s a fact. No matter who you are, how young or old, what measure of success you’ve attained, or where you live, mortality remains the great equalizer. With each tick of the clock, a moment of your life is behind you. Even as you read this paragraph, seconds passed that you can never regain. Your days are numbered, and each one that passes is gone forever. If you’re like me, you may be tempted to view this reality as harsh and unwelcome, to let it overwhelm and even paralyze you. But that’s not my purpose in writing this book–just the opposite. Rather than inhibiting us to play it safe, I’m convinced that embracing our time on earth as a limited resource has incredible power to liberate us. For most of us, if we knew we only had one month to live, we would live differently. We would be more authentic about who we are and more deliberate about how we spent our time. But such a contrast begs the question: what keeps us from living this way now? My motivation to find the answer–and better yet, to live it and help you live it–is born in part from my experience in ministry. In this role I’ve been privileged to spend time with many people as they face the imminent end of their lives on earth. While all of them struggle through the stages of grief–shock, denial, bargaining, guilt, anger, depression, acceptance–most of them make radical changes as a result of their awareness of their terminal conditions. They take license to say what they really feel and do what they really want. They ask for forgiveness and forgive others. They no longer think only of themselves but reach out to those they love and let them know how much they mean. They take risks they would never have taken before and allow themselves to lay worry aside and gratefully accept each new day. They seem to gain a new clarity on their priorities, like their relationship with God and leaving legacies that will endure. Why can’t all of us live more like we’re dying? Isn’t that how we were meant to live in the first place? To discover what we’re made for and to utilize our unique gifts in the limited amount of time we’re given? So last year at a staff retreat I tried a little experiment and asked our team members this question: “If you knew you had one month to live, how would you live differently?” I gave everyone a journal and challenged them to live the next thirty days as if they were their last and to write down what happened. The results were nothing less than life changing! At the end of the thirty days, we all had a greater clarity of purpose and a renewed passion for the things that really matter. Many people did big, once-in-a-lifetime things, like going on a dream vacation to Hawaii with their spouse, finally getting serious about a healthy lifestyle and losing twenty-five pounds, or reconciling a relationship with a parent that had been neglected for years. For me, the little, daily things took on a whole new meaning and forever changed my life. Taking my youngest two children to school every day became a real joy. I became keenly aware of what a sacred moment it is every morning to play twenty questions with Steven and to make up silly songs with my teenage daughter, Megan. I made sure that I met my two oldest sons, Ryan and Josh, at their favorite restaurant once a week after school just to connect. Many of our staff members did whatever it took to be at all their children’s ball games, recitals, and school events. At the same time, I noticed that the team was more productive than ever, wanting the things they did at work to make a lasting impact. I’ve since come to believe that the one-month-to-live lifestyle is universal in principle but unique in its expression. If we all lived as if we had one month left on this earth, we would each spend our days differently, in ways unique to us, and yet I believe we would all experience more fulfilling lives that could leave a legacy for eternity. Perhaps no place echoes with eternity quite like a cemetery. Not surprisingly, I’m fascinated by old gravestones and the lives they represent. The dates on some of the old monuments and grave markers in the Houston area where I live go back to the eighteen hundreds. My imagination launches me into the various stories that each marker tells. I find myself pondering what life was like in 1823 or 1914. I know people back then had the same problems and pain as everyone does in life, but I wonder if they felt as stressed and pressured as I do. Our technology and modern conveniences have revolutionized our twenty-first-century lives but at what price? What did he live for? Whom did she love? What were his passions? What were her biggest mistakes and greatest regrets? When you think about it, we don’t have control over many things in life. We didn’t get to decide where we were born, who our parents are, or which time period and culture we face. We don’t get to decide the dates on our gravestone. We don’t know when our time on this earth will be up. It could be next week or next year or decades away. Only God knows. Our lives are in His hands. But there is one thing we have a vast amount of control over. We get to decide how we’re going to use our dash. You get to choose how to spend that little dash of time between the two dates of your earthly existence. What are you spending yours on? Are you living the dash, knowing fully who you are and why you’re here? Or dashing to live, hurriedly spending precious time chasing things that really don’t matter to you? The psalmist prayed, “Teach us to number our days and recognize how few they are; help us to spend them as we should” (Psalm 90:12, TLB). God wants us to realize that our time on earth is limited so we will spend it wisely. But He gives us the choice about how we spend this most valuable currency. While many of the people I’ve known who are facing death make radical changes in order to die well, occasionally I meet some who change very little. It’s not that they are unwilling to change. It’s that they have lived so deliberately and so authentically that the news of the end of this life doesn’t turn them upside down. Of course they grieve and struggle with the news. They ache for their families and the people they love. But they take comfort in knowing they have been living focused on what matters most to them: their relationships with the ones they love, their relationship with the God of the universe, and the fulfillment of their unique purpose on this earth. Wouldn’t it be wonderful to spend your life so that if you discovered you only had a month to live, you wouldn’t need to change a thing? What’s holding you back? What are you waiting on? Repeatedly in Scripture, God reminds us that our lives are short compared to eternity. Of course I’m not encouraging you simply to live for today. Most of us can’t afford to quit our jobs overnight, say what we’re really feeling all the time, or act on every spontaneous idea. This kind of a lifestyle seems selfish and wildly indulgent and may indicate that such a person doesn’t believe there’s anything beyond this life. But life is more than what we know of it on earth. Even as we engage ourselves in the present, we must think through the eternal impact of how we live. The Bible tells us that God has placed eternity in our hearts (Ecclesiastes 3:11). He created us in His own image as spiritual beings but in fleshly bodies. If we’re honest, most of us sense there has to be more to our existence than what this world can offer. This is the point where many people turn to faith. But just as some people live like there’s no tomorrow, others use their faith to live like there’s no today. They’re always thinking about heaven “some day” instead of fully experiencing life today. The only way we can live for eternity is to embrace each day as a gift from God. We must live in the tipping point between the everyday and the eternal. He created us and has given us another day to live–to know and experience His love, to love and serve those around us, to live passionately the life He’s made us for. The temporal nature of our lives should keep our focus on what matters most. Be brutally honest with yourself. Your time on earth is limited. Shouldn’t you start making the most of it? If you knew you had one month to live, you would look at everything from a different perspective. Many of the things you do now that seem so important would immediately become meaningless. You would have total clarity about what matters most, and you wouldn’t hesitate to be spontaneous and risk your heart. You wouldn’t wait until tomorrow to do what you need to do today. The way you lived that month would be the way you wished you had lived your whole life. If you knew you had one month to live, your life would be radically transformed. But why do we wait until we’re diagnosed with cancer or we lose a loved one to accept this knowledge and allow it to free us? Don’t we want all that life has to offer? Don’t we want to fulfill the purpose for which we were created? Wouldn’t life be a lot more satisfying if we lived this way? I’m challenging you to start living your life as though you have one month to live, and I’ve designed this book to help you. There are four universal principles in the one-month-to-live lifestyle: to live passionately, to love completely, to learn humbly, and to leave boldly. I’ve divided this book into four sections or “weeks” accordingly, and I encourage you to live these next thirty days as if they were your last. For each day there’s a chapter designed to help you focus on that week’s principle. Each chapter also contains two features to inspire your thirty-day life experiment. Throughout each chapter, you’ll find “Make It Count Moments” with questions designed to help you examine your life and focus on what’s most important. The other feature, called “Make It Last for Life,” comes at the end of each chapter and offers ways to act on that day’s focus. These action points don’t require homework so much as they inspire lifework, ways for you to implement and personalize the material to your life. You may want to allow time to think through these items, to journal about them, and to pray about them. If you’re reading this book with others in a group, then this will be a great place to focus your discussion. Regardless of how you use this book, my hope and prayer is that you’ll think seriously about what you want most out of life and what keeps you from pursuing it. I hope you’ll embrace the fact that someday your life will come to an end so you will begin to live each day more fully. You don’t have to wait until there’s a crisis to consider how you can experience life to the fullest. If you’re willing to take this thirty-day challenge, be prepared for life to radically improve. You can live with no regrets and embrace a life so abundant you’ll wonder why you ever settled for less. There’s no time like the present–right now!–to get started. Reading this book takes time, your most precious commodity, and I promise not to waste one second you spend on these pages. As you discover the life you were made for, today can truly be the first day of a life with no regrets. Claim today as the start of a month that’s guaranteed to change your life!